Authorization was difficult in previous versions of IIS. Because IIS only worked with Windows identities, you had to go to the file system and set Access Control Lists on files and directories. This was tedious because the ACL UI is complex and authorization rules do not copy very well from machine to machine. IIS 7.0 and above uses URL Authorization. It allows you to put authorization rules on the actual URL instead of the underlying file system resource. Additionally, the IIS URL Authorization configuration is stored in web.config files-- you can distribute authorization rules with the application content. 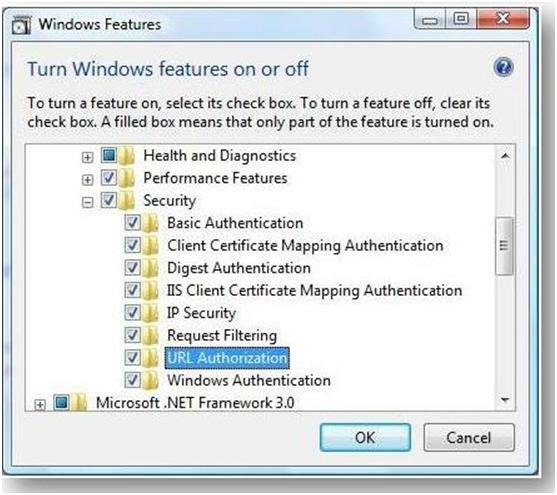 The following walkthrough introduces you to the IIS URL Authorization feature in Windows Server® 2008 Beta 3 and Windows Vista Service Pack 1. "ASP.NET" under "Internet Information Services" – "World Wide Web Services" – "Application Development Features"
"URL Authorization" under "Internet Information Services" –" World Wide Web Services" – "Security"
Let's simulate a scenario where you have a secure directory that only Alice, Bob and the Administrators group can access. Within this directory we have a file called bobsSecret.aspx that only Bob is supposed to access. Open Explorer and go into the %systemdrive%\inetpub\wwwroot directory. Create a directory called "secure". Change into the "secure" directory and create a new file called "default.aspx". You can do this with notepad or any other text editor. Now see if the two web pages work by requesting http://localhost/secure/ and http://localhost/secure/bobsSecret.aspx. Authentication answers the question "who" wants to have access. Authorization answers "if" the authenticated "who" actually gets access. So, before experimenting around with URL authorization, we must enable authentication because without knowing "who" wants to have access, we cannot answer the "if". Start INETMGR by typing INETMGR in the "Start Search" menu. Open the machine node in the left tree view, then open the "Default Web Site" node and select the "secure" directory. Disable "Anonymous Authentication" and enable "Basic Authentication." Now request http://localhost/secure and http://localhost/secure/bobsSecret.aspx again. You will get prompted for credentials. Enter "Alice" as username and her password. You will be authenticated as "Alice". If you use Internet Explorer, you may to hit Ctrl+F5 so that Internet Explorer refreshes the cached version of the ASP.NET page. Double click the "secure" web directory again and select "Authorization Rules". Remove the "Allow All Users" rule. Click "Add Allow Rule…" and select the "Specified roles or user groups:" radio button and add "BobAndFriends" and click the "OK" button. Close all Internet Explorer windows because Internet Explorer caches the credentials that you entered in the previous step. Open Internet Explorer and try to access the page using Fred's credentials. You do not get access. Now try Bob's credentials or Alice's credentials. You get access. Double click the "Secure" web directory again and select "Content View" at the bottom of the page. You will see a list of files in the secure folder namely "default.aspx" and "bobsSecret.aspx". Right click on bobsSecret.aspx and select "Feature View"
Now you are making only changes for the bobsSecret.aspx page as indicated in the statusbar. Select "Authorization Rules" again. You see the inherited settings, i.e. the BobsAndFriends group is allowed to access bobsSecret.aspx. 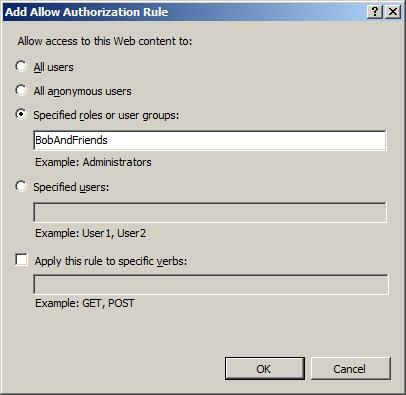 Now click "Add Allow Rule…"
Click the "Specified users:" radio button, enter "Bob" and click "OK". Only by entering Bob's credentials will you get access. The next paragraphs show some advanced URL Authorization topics. ASP.NET Url Authorization is installed when you install ASP.NET on top of IIS. If you are an ASP.NET expert, you recall that ASP.NET UrlAuthorization is implemented in the System.Web.Security.UrlAuthorizationModule module. The corresponding configuration section is system.web/authorization. Here is the configuration entry. The IIS URL Authorization module is implemented in the global module urlauthz.dll. It is important to keep in mind that the managedHandler precondition is on the ASP.NET UrlAuthorization module. The precondition tells you that the URL authorization module is invoked only when the code that handles the request is mapped to managed code, typically an .aspx or .asmx page. IIS URL Authorization, on the other hand, applies to all content. You can remove the managedHandler precondition from the ASP.NET Url Authorization module. It is there to prevent a performance penality you have to pay when every request (such as a request to .html or .jpg pages) would have to go through managed code. There are also differences in the order in which IIS and the two URL authorization modules evaluate authorization rules. ASP.NET URL Authorization is developer-focused and developers have full control over which rules they set. IIS URL Authorization keeps the Administrator in mind and tries to make sure that developers cannot override the rules an Administrator sets. This configuration denies access to anonymous users (? = anonymous users, * = all users). With the lockElements="clear", you ensure that no one on a lower level can clear the inheritance of this setting. Your setting would be inherited to all applications and virtual directories of this site. It comes to a lock violation when you try to use the <clear/> statement at a lower level. For more information on configuration locking, see https://msdn.microsoft.com/library/ms178693.aspx. You can also lock the clear element in ASP.NET Url Authorization. The problem is that ASP.NET URL Authorization evaluates authorization rules from the bottom up, i.e. it first evaluates rules in the current web.config file before it evaluates parent rules. As soon as a match is found, access is granted or denied. In the above example, you can still grant access to anonymous users by specifying <add users="? "/> as an authorization rule in the secure web.config file. Because it gets evaluated first, anonymous users would be granted access. The IIS URL Authorization module evaluates deny rules first. Because you deny access to anonymous users, you cannot simply override that rule. The other big difference is that parent rules are evaluated first. This means that if you deny access for Fred at a higher level, you can't allow access to Fred on a lower level. URL Authorization is not only for Windows identities. It works well for non-Windows, too. Use it together with ASP.NET Membership and Roles and for custom identities, in case you write your own authentication module. URL Authorization is a powerful new way to specify authorization rules for web applications. 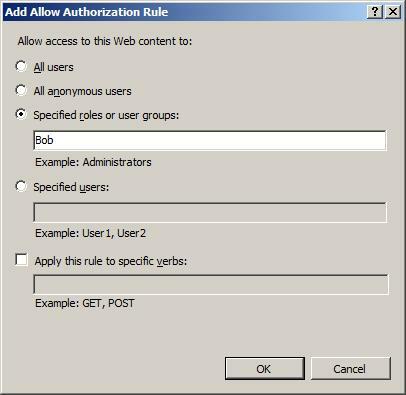 Now you can specify rules in XML without using Windows Access Control Lists any longer.